Habitat : It is widely cultivated in sri lanka & india. 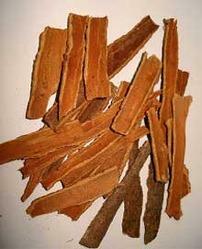 Uses : Cinnamon stimulates the urinary tract and can be used for problems of the kidneys, edema and urinary retention. He also recommends it for cough and congestion of the respiratory system. In Indian and Sri Lankan cooking Cinnamon is used as a common spice, not only for sweets, but also as an integral part of the spice mixture known as 'curry powder'. It is frequently mixed with honey and taken as tea, though the British found it more to their taste to add rum and lemon to the brew. Cinnamon is also an essential ingredient of 'Chai', the Indian spice tea, which was long rumored to have properties. In Ayurvedic medicine Cinnamon oil is used in external applications for rheumatism, aching joints and stiffness. It is also used for toothache and sore gums, much like clove oil. Cinnamon is a spice that brings blood to the surface of the skin, causing minor swelling and plumping. A preparation of three drops of cinnamon essential oil mixed with a couple tablespoons of petroleum jelly or olive oil can be applied to fine lines to plump out the skin, making the lines less visible. Cinnamon can help clean and nourish the scalp by acting as an exfoliant and bringing blood to the scalp, and along with it, oxygen to nourish the hair follicles.